"This film offers hope in the truest sense: it sees reality as it is and as it will be, given the current trajectory. It imagines a positive future, and sees myriad pathways to get there, through the small choices and actions each of us take, to act in ways that build up all the good and beautiful parts of ourselves that climate can't change. The film takes us to the place of despair, recognizing it is only in that moment of utter despair that we can move through grief and toward real hope." "Highly Recommended...An excellent choice for environmental clubs and environmental film series...Viewers are inspired." "In How to Let Go of the World we are exposed to the despair, fear, frustration, beauty, hope, and 'moral imagination' of a world grappling with climate change. By being fully open to the complexity and uncertainty of our predicament, Fox invites us to be vulnerable with him. Appropriate for both classroom and community discussions." "Thought-provoking and entertaining...Offers hope for environmentalists and encourages viewers to make small changes to support the process." "What can't climate change? Innovation, resilience, creativity, courage, song, and dance...This documentary may move older high school students to tears and inspire them to become climate change warriors." "Combining a personal perspective with a global survey of community responses to the challenge, it is simultaneously a tragedy about climate change and a celebration of human potential. Like the director, you may find yourself both crying and dancing." "[A] globe-trotting survey of climate change players and hazards...This environmental report from a concerned citizen is recommended." "Very powerful! A 'must see' film for all university students taking courses that address the environment. Climate change is our biggest environmental problem by far and we all need to understand the issues. How to Let Go of the World does a fabulous job of explaining the multifaceted issues of our rapidly changing climate." "A film that is both decidedly alarmist and yet unmistakably optimistic...It's clear as to why this is without a doubt one of the most engaging documentaries of the year." "Eye-opening...In finding acceptance of the challenges to come, and trying to locate heroes instead of reasons to despair, Fox hits that sweet spot between realism and idealism." "A sprawling chronicle of despair - and hope...A fascinating, heartbreaking and ultimately inspiring ride...Highly engaging." "How to Let Go says all the right things about an unnerving peril, and the various ways some highly motivated people are trying to combat it." "Highly entertaining, imaginative, and often emotional...A stylish cinematic tour de force." 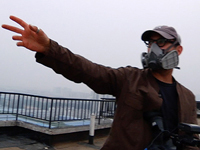 "A dynamic doc with an insistently hopeful resolution." "A one-word assessment of this documentary: Tough. As in, tough to watch. Tough to consider. Tough to ignore." "The culmination of disaster footage and shocking talk from scientists make this compulsive viewing." "Informative, emotional, intermittently powerful, intriguing...A sobering, solid film that raises indisputable evidence and proof that we are in the throes of a climate crisis." Mike Ward, Should I See It? "As we try to help our students and neighbors wrestle with the despair we may all see from the loss of species, places, and people to rising seas, stronger storms, and other impacts from climate change, this is the movie to show. Too often, we can be overwhelmed by the magnitude of the challenge and become mired in apathy - this film uses humor and wisdom to move from well-informed futility to action guided by courage and community."